How I created the image – Ancestors. To the Tohono O’odham (desert people) tribe of Southern Arizona, the iconic saguaro cacti of the Sonoran Desert are ancestors. They revere them and will not collect their woody skeletons for firewood, as that would be an act of burning one’s ancestors. The cacti resemble people in their general form, with outstretched arms protruding from their elongated bodies. But they are so much more. The gray scale (black and white) image I created called “Ancestors” was originally shot in April, 2013 using a full-frame Nikon D800 camera and a 28-70mm lens. I shot to camera raw in color, and initially processed it as a color image. 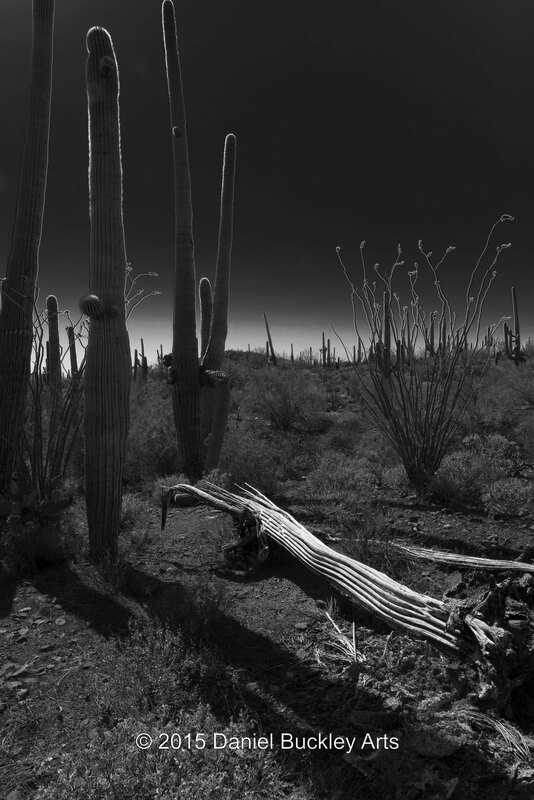 The photo was shot at Saguaro National Park West, just west of Tucson, Arizona. I would return to that image in 2015 to create a new gray scale version. Often I revisit older images once I have developed other skills. Working in camera raw affords so much flexibility when editing in Adobe Photoshop. The areas in shadow are easily brought out, and the general character of the image can be manipulated in many ways. Most of the basic manipulation was done within camera raw, working to get the details and contrasts just right before starting the gray scale conversion, and making minor tweaks after as well. When converting to gray scale, Photoshop allows one to manipulate the different colored light individually. Although the original image was shot at approximately 3:30 p.m., I wanted to create the illusion that this was a moonlit image. The sky was vivid blue in the original, so I reduced the saturation of the blue channel to zero to create the illusion of a black sky. Reds, yellows, oranges and greens were likewise heightened or reduced to bring out specific features within the shot. And once the basic image was complete and it had been changed to a Photoshop image, I applied curves to heighten the contrast and exaggerate the glow around the perimeter of the saguaro and the outline of the ocotillo. 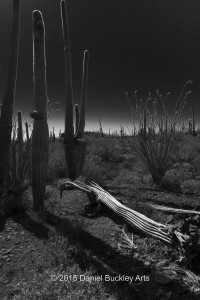 The final image has the kind of other worldly quality I set out after, amplifying the spiritual meaning of the living saguaros and the skeletons of those who came before, and lending a kind of metaphysical glow to the desert and horizon. ~ by Daniel Buckley on June 1, 2015.